The kitchen, for many years, has been considered the heart of the home. It’s the place where families gather to cook and eat together, and it’s a place you “break bread” with your nearest and dearest. Times have changed with the modern, fast-paced lifestyle so many of us live, but the basic principles still apply. When you’ve moved out of home or you’re starting afresh, it can be difficult to know how to make your kitchen as practical as possible. Some recipes, especially for desserts, require several different utensils – ones that you might not own. That’s why you turn to a kitchen utensil guide. Within this article, we list the several basic kitchen utensils and items any kitchen should have. This might help you on your way to providing delicious family meals without the stress of substituting. You can simply head to your local homeware store and pick up everything you need. Ladle – for liquid meals such as soups or stews. Slotted spoons – to allow vegetables and pasta to be served onto plates without liquid. Tongs – for serving meat and other larger food products onto plates and serving dishes. Salad tongs – pronged fork and a spoon for serving salads easier. Bowls of various sizes – for serving and storing various side and main dishes. Casserole and oven dishes of various sizes – for cooking food within the oven. Frying pans – choose at least two sizes for convenience and cooking two components at once on the stove top. 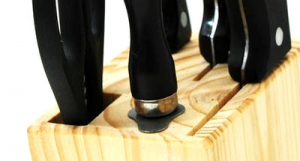 Sharp knives of varying sizes – perfect for slicing fruit, vegetables and meat finely. Invest in a knife sharpener to go with it. Grater – perfect for cheese, carrots and several other fruits, vegetables and herbs needing minced and grated. Kitchen shears – for cutting herbs finely. Garlic press – when crushed garlic in a jar just won’t do. 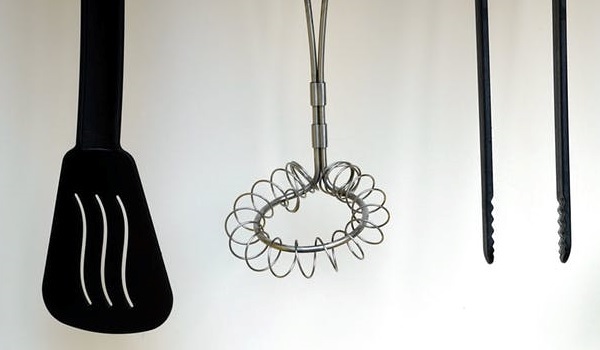 Potato masher – an essential tool for getting that potato mash prepared ‘just so’. Serrated bread knife – perfect for cutting bread without creating a mess, and even slicing pizza. Fish slice – for flipping meat. Potato peeler – getting those vegetables with tough skins peeled with minimal flesh loss. Can openers – an easy and quick way of opening cans. Thermometers – checking how cooked meat is, and desserts. Corkscrew – it’s hard to open corked wine without one! Measuring cups – essential for recipes that require you to measure cups exactly, just as flour. Measuring jug – more convenient for liquid measuring. Measuring spoons – more exact and convenient than standard serving spoons. Kitchen timer – while most ovens come equipped with one, it pays to have another kitchen timer in case you’re not close to your oven. A sieve/colander – makes draining pasta and vegetables so much easier. Kitchen scales – for measuring butter and other similar ingredients that can be hard to measure in cups or spoons. Dinner plates – large plates for serving full meals. Dessert bowls – for ice cream and cake. Glasses – for cold drinks. A full cutlery set – make sure you purchase one which comes with at least 4-8 of each utensil.